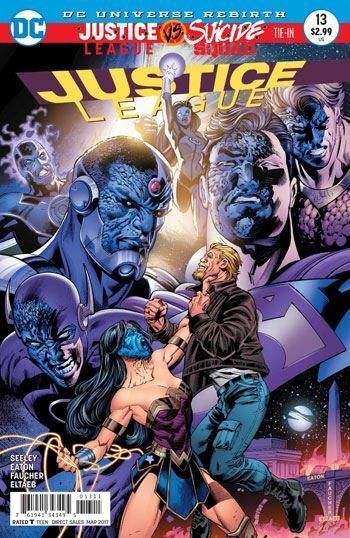 After the last issue of Justice League ventured into the new backstory for Maxwell Lord, and the most recent issue of Suicide Squad detailed the very first incarnation of Amanda Waller’s band of criminals, I had expected Justice League 13, which is also a tie in to the Justice League vs Suicide Squad miniseries, to delve into Eclipso’s background. I was wrong. But not so wrong that I am upset about it. Eclipso is featured throughout Justice League 13, though mostly through his ever increasing possession of the population. The true star of the issue is Steve Trevor, now bearded. The plot of the issue is really very basic. Most of it consists of Trevor avoiding all the Eclipsed people he comes across as he tries to make it back home. The simplicity of the tale helps highlight the horrors he witnesses along the way. 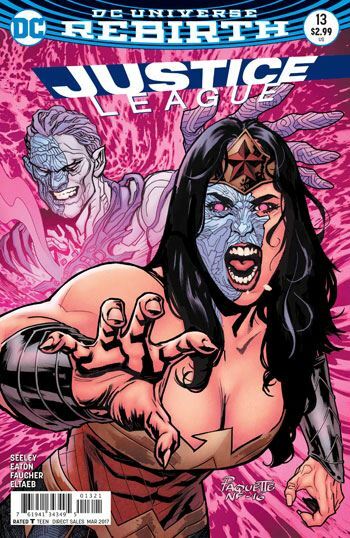 And make no mistake about it, Justice League 13 is a horror story, pure and simple. At their best, Eclipso stories venture into disturbing and disgusting territory. The way the villain digs into the corruption and petty hatreds of everyday people, expanding and pulling out their worst tendencies, makes everyone a victim of him. And the nicest, most unassuming characters wind up performing atrocities. It’s the old woman and her dog that really stands out in my mind after this issue. Just awful. But also, perfectly Eclipso. I am guessing that Steve Trevor will play a significant role in the conclusion of the miniseries, simply based on his starring role in this issue. Steve has not been a part of the story up until this point, and there was no obvious reason to centre an entire issue of the book on him, so his importance must be yet to come. Some great, and revolting, art by Scot Eaton and Wayne Faucher helps make this a tie-in completely worthy of being a part of the excellent miniseries.